Donald Skidgel's children stand next to the newly placed plaque memorializing their father who received the Congressional Medal of Honor after dying in the Vietnam War. The Donald Sidney Skidgel Memorial Bridge was officially unveiled during a ceremony on the Sebasticook River in Newport on Saturday. 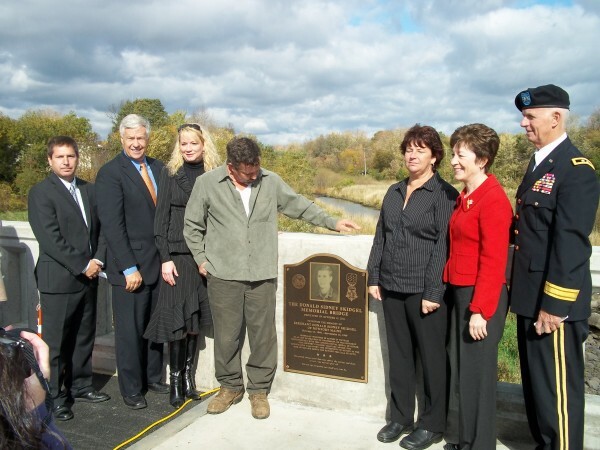 In the photograph are State Rep. Kenneth Fredette (from left), U.S. Rep. Mike Michaud, Skidgel's children Mindy Martin, Terry Skidgel and Tammy Russell, U.S. Sen. Susan Collins and Gen. John Libby. NEWPORT, Maine — A Vietnam War hero now has a permanent home in Newport. The new bridge crossing the Sebasticook River was renamed the Donald Sidney Skidgel Memorial Bridge on Saturday in honor of the Congressional Medal of Honor recipient. Sgt. Skidgel was killed in battle near Song Be on Sept. 14, 1969, after drawing enemy fire upon himself in order to save lives of his fellow soldiers. He was just a month away from his 21st birthday. He is buried in Plymouth. Sen. Susan Collins, Rep. Mike Michaud, State Rep. Kenneth Fredette and Maine National Guard Major Gen. John Libby spoke during the ceremony, which included much of Skidgel’s family. About 250 people gathered on the bridge. Skidgel’s three children stood with the speakers to unveil the plaque which bears their father’s image. “I’m very honored. I appreciate everything,” said Terry Skidgel of Plymouth, Sgt. Skidgel’s son. Mindy Martin of Bangor, Sgt. Skidgel’s other daughter, also attended. Gen. Libby brought many to tears after telling how hard it was to deal with memories of fallen comrades from Vietnam. “The wall in Washington, D.C., was dedicated in November of 1982,” said Libby. “It took me several years before I found the courage to visit the wall. In 1984 [I visited the wall] under the cover of darkness. I knew exactly why I did it at that time of day because I was afraid of what the memories that might rush back from visiting it for the first time. Michaud, Collins and Gail Kelly of Brewer, who read a statement from Sen. Olympia Snowe, spoke of Skidgel’s bravery. Collins commented on how rare it is for a soldier to receive the Congressional Medal of Honor, the highest award a military member can receive. Newport Town Manager Jim Ricker said it wasn’t difficult to get the bridge named in Skidgel’s honor. After the Town Selectmen decided to have the new bridge named for Skidgel, Ricker asked State Rep. Fredette to sponsor a bill for the name change. Ricker said it passed through Congress and was signed into law by Gov. Paul LePage. The six months of effort were worth it for Ricker. The total cost of the bridge was $1.7 million and replaces an 81-year-old predecessor, according to Snowe’s speech spoken by Kelly. “May this passageway … serve as a constant reminder of the storied exploits of its namesake and of the inexpressible debt of gratitude we owe all soldiers and their families — a debt which we can never repay, but must never forget,” said Snowe in the prepared speech.